The past weeks's fishing can at best be reported as fair. I've spoken with several of the other Lake Texoma guides who report about the same number of fish caught per trip as we are seeing and that live bait is the only way to go. We've seen fish in the 9-10 lb. range the last few days. You can stow the anchor for the time being. You may very well find large schools of stripers in 45-60 foot of water, but these schools seem to be not in the feeding mood. You should have much beteer luck looking for 30-45 foot deep ranges of water where you can make a long drift. You will cover a lot of water and catch some feeding fish on each drift. I've tried anchoring and had limited success. I have had the best results from west of Highport Marina to as far west as the Willis-(Hwy377) Bridge, drifting. Look for a change in the weather this coming weekend. The forecasters are saying the rain is on the way. 20% chance Friday and Saturday raising to a 40% chance of the wet stuff Sunday. Spring Break is starting next week. The rainy forecast for the weekend turns into nice warm spring days in the 60-70's for next week. 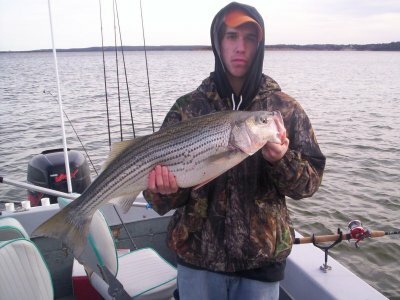 Remember a day fishing on beautiful Lake Texoma makes for a great day off.